The Elite 5220 computer mount is popular in dental and healthcare settings. 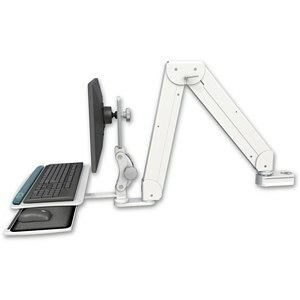 A true sit-stand workstation, this arm provides up to 42″ (106.7 cm) of vertical adjustment, enabling staff members of different heights to work in comfort. For example, it can easily and quickly adjust for either a 5’ person or a 6’6” person. Sit-stand workstations, which are defined as having at least 21″ of vertical adjustability, enhance employee health, reduce fatigue and eliminate “sitting disease.” The Elite 5220 pole mount reaches up to 68″ (173 cm) and swivels 360° at mount, allow you to easily move your computer wherever it’s needed.